Flash decompiler trillix is a powerful swf to fla converter with the ability to decompile flash files, extract swf elements to multiple formats and edit swf files (texts, hyperlinks, images and more) without swf to fla conversion. Flash decompiler fully supports flash 5, 6, 7, 8, 9, 10, flash cs5 and cs5.5 (supports tlf texts and conversion. 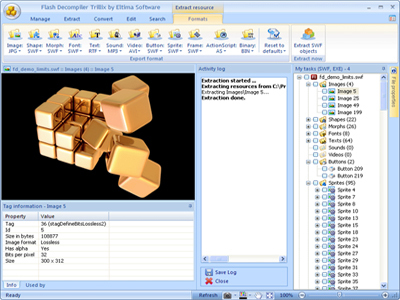 Flash Decompiler Trillix is a web development program that works under windows xp, windows vista and windows 7. It supports both 32-bit & 64-bit windows editions, therefore it could run faster on 64-bit computers. Estimated download time for Flash Decompiler Trillix on a common adsl connection is less than a minute. Version 5.3.1 was released one thousand five hundred sixty three days ago by Flash Decompiler Software. Click the green download button to download it now.